A pic taken on my way to a basketball game. 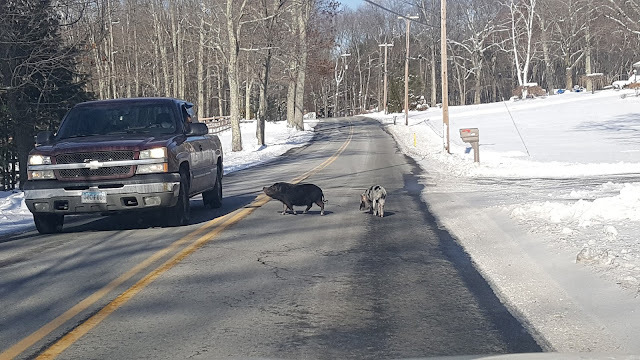 Pigs randomly walking in the road. Sums up how I feel right about now. Sick of winter and searching for a way to feel comfortable in my own skin. My ultimate goal in life when it comes to health and weight loss is to be able to eat without counting calories or points. That can be very difficult for me. Since starting this blog I have earned a degree in Exercise Science and I now have certifications: ACSM CPT, ACE GFI and I've completed coursework to be a licensed coach in my state. With all my education and personal experience (80 lb weight loss) I would have thought things would be easier by now but they're not. Science has proven that when it comes to weight loss it's calories in vs. calories out. Unfortunately calorie counting doesn't account for all the psychological, sociological and biological reasons why we eat what we eat. I need to try a new approach so I'm going to continue with the ww program for now. Ultimately I would love it if WW would incorporate calories as a form of measure along with the points system. The new WW points system bases most veggies (including corn and peas) and all fruits as being zero points (of course everything does have calories). No fat/low fat protein foods are also zero points (chicken breast, turkey, eggs, fat free greek yogurt). Lets face it if I never ate cake and only ate fruits, veggies and lean protein I wouldn't have a weight problem. I would have never been fat. Growing up my snacks were boxed macaroni and cheese, PBJ, popcorn w butter and apples w pb (apples and pb is not a bad snack) and trips to the convenience store for junk food in the summer. When I got my first car that was my ticket to fast food drive through windows. I think it's been about 8 years since I had any fast food (now my fast food is typically nuts, fruit, cheese and sometimes a granola bar that I bring with me). When I say calorie counting doesn't work for me it doesn't mean that the science behind calories and weight loss isn't true because it is. What I mean is I don't envision myself spending the rest of my life writing down every morsel of food I put into my mouth. My goal is to have 3 healthy meals and 1 - 3 snacks a day and not having to count calories while maintaining a healthy weight. Currently I'm not at a healthy weight however I have lost 7 lbs since January. I play pickleball 2x a week, weight train, endurance train and just recently started run walking again for the first time in years. Since losing 80 lbs several years ago I gained 50 of those lbs back. I've had two back surgeries along with many pints of Ben and Jerry's as part of my recovery in addition to being diagnosed with major depression. I've had many weeks of physical therapy with various injuries including a badly sprained ankle, shoulder, knee etc... Now I'm in a grove with my exercise routine and I'm working on my diet. However for the first time since my 80 lb weight loss I have noticed a difference in my blood pressure. The other day I had a head ache and my blood pressure was up to 140/76! My blood pressure is normally 117/76. That is my wake up call to work hard on getting healthier. In my family there is high blood pressure and high cholesterol, diabetes and strokes. Yikes! My diet isn't bad perse just every so often there's a birthday party or special occasion (or stress) and I go overboard on sugar. Sugar is my weakness. Sugar has a way of causing havoc with hunger. Simple carbs or table sugar creates the temporary satisfaction of something sweet and comforting however that is soon replaced by a crash and the feeling of needing/wanting to eat more of that sweet treat. It's hard trying to find the balance of eating well and still allowing myself that occasional cookie without completely falling off the wagon. Finding balance is very difficult. I often use liquid stevia in things like coffee to add some sweetness without chemicals and that helps but sometimes when it comes to items like a cookie I just need real sugar and cookies sweetened with stevia wont do. So in my quest to yet again lose fat what method do I use? What I do like about the latest version of WW (2018) is that it does focus on whole foods, lean protein and portions. I'm going to really focus on getting more vegetables in my diet and spend more time to plan ahead for snacks. As a last resort I'll go back to calorie counting but it's not something I really want to do (I have a really difficult time staying in my calorie deficit range). I hope to find a method that works somewhere in the middle. I'm working on my resolve and will continue to push forward. Writing and sharing my personal experience helps me a lot!